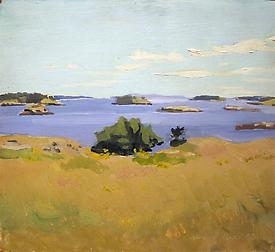 The realist painter Fairfield Porter (1907-75) bucked the abstract orthodoxy of postwar American art to paint representationally. He continues to be a polarizing figure among contemporary painters, some of whom feel he was a better art critic than artist. If you are still on the fence about Porter, see this small show of eight paintings and one drawing from the 1950s through the 1970s, mostly landscapes. Porter's pictorial ideas are distinctly American—plainspoken. In "Armchair on Porch" (1955) he achieves a golden, dreamy light and a sense of outside pouring inside. In "Under the Elms" (c. 1970) he gives iconic status to dappled light and standing figure. And in "Katie and Jacob in the Yard" (c. 1953), the children become toy-like, seemingly overwhelmed by the windswept grasses while the rugged trees, each with an individual temperament, become personages. This show is too slight to convert detractors (for that we need a major Porter retrospective). Fresh and lively, however, it reminds us that Porter was genuine, intuitive and clear-headed at the easel.